Standing still practices are widespread in the Chinese martial arts world. Most styles have some type of standing still practice, and most qigong is derived in some degree from these practices. For the sake of explication I'm going to divide stillness practices into two halves-- meditation and power-stretch. Power-stretch is a group of methods dealing with the transitions from stillness into movement and will be the subject of a future post. Meditation is only half of the big subject; "stillness practices." But meditation in the martial arts happens in both movement and stillness. The most difficult thing for modern people to understand is that meditation training requires no instruction. It is not something we do with our minds. Meditation is not a clearing process or a form of mind-body repair. The martial arts are loaded with many different types of trance which do such things, but meditation is simply not a mental process. The most common type of meditation in the martial arts is the practice of a form. In order to practice meditation using a martial arts form one simply does the form. (This is true regardless of the style, shaolin, taijiquan, baguazhang, or something else.) Do the form without self-correction. Do the form without any attempt to make improvements. Do the form without thinking of applications. Do the form without any agenda or focus, and you will be practicing the most basic and essential form of martial arts meditation. Standing meditation is essentially the same. Stand in a posture which makes it easy to be still and discard the idea that stillness has an agenda, a focus or a reason. Some postures are easier than others, and for this reason having a teacher to correct your posture is very helpful. But whether you have a teacher or not, basic standing is practiced daily for one hour. After about 100 days the posture itself should start to reveal effortlessness. The subject of trance in the martial arts can be divided into three basic categories, all of which are total sensery experiences. However; for the purpose of explication, each of them can be distinguished by the ways in which they use visualization. Before I describe them, let me make it clear that I believe one should first practice a form, devoid of planning, agenda, magic, power, or utility. However, being a realist, I know that it is a rare student who comes to the martial arts without an agenda of fighting, prowess, heroism, health, vanity, or the desire to dominate. The old masters got around this by insisting on total subordination to the teacher. In my world I offer limited fulfillment of these "martial wonders" up front-- from day one. Through developing a personal relationship with my students I can slowly introduce the practice of emptiness and having a "zero" agenda. In other words, the "zero" of martial arts meditation, and the one, two, and three of "power-healing trance" (see below), have no inherent order. They can be taught in any order-- in a disheveled go-with-the-flow way. However, at some point that zero-emptiness meditation practice must be established or the student will not have a dantian for their practice. The word dantian (literally cinnabar field) refers to a large empty space for doing ritual. It is most often described as a location in the center of the body; but as metaphors go, we could also describe it as a container, a vacuum, or silence. 1. Deities. These are aspects of truth and nature. Some have biographies, or histories, and some do not. They are known by a list of their attributes which are then visualized in front of the martial artist, then above one's head and then descending into and merging with the visualizer. 2. Environment. 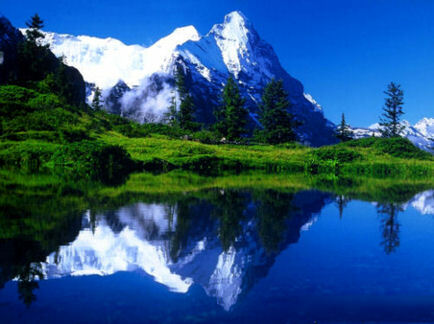 One can visualize walking on a lake, in mud, through clouds or on a high mountain ridge. There is really no limit here. In baguazhang for example there are visualizations of walking through a tunnel of spiraling fire, or being surrounded by five mountain peaks. One can also visualize abstractions like the eight trigrams of the yijing (I-Ching) transforming into each other. Probably the most common thing to visualize is martial applications of fighting techniques. 3. Visualizing spaces within the body. For instance a huge palace can be visualized at the throat notch, or two deities sitting on your kidneys. Spaces can be empty or full, vacuous or active, dark or light. Spaces can be finite and solid, or infinite and formless. Basic "dissolving" practices like ice to water, water to steam fall into this category. The three categories can overlap each other. A deity can be both inside and outside the body. The boundary between inner and outer can dissolve. Next week I'll deal with the power-stretch half of stillness practices...ways of understanding transitions to movement.